This is a difficult post to write. After all, I would never have dreamed that I would be telling you about a battle between our Roussane grapes and bunch rot. But, this is real life and I want to be real with you, sharing the ups and downs. Before I give the sordid details, let me just say that God is God in the good times and the bad. 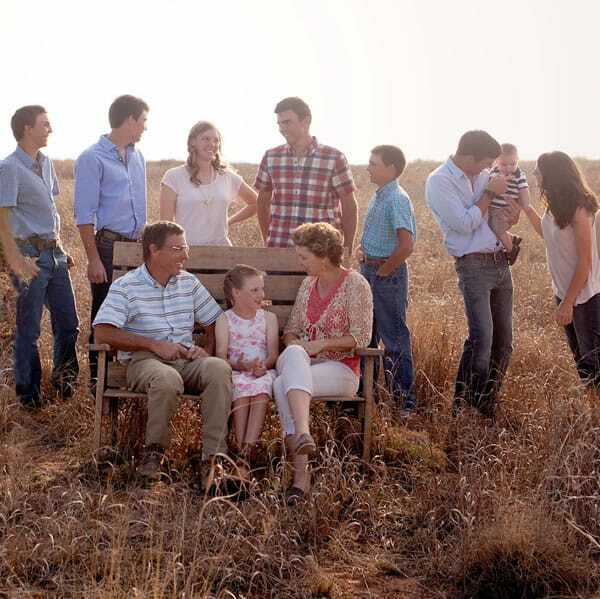 And, he has definitely blessed us as a family – even though this is very humbling! In the past couple of weeks, we have had an enormous amount of rainfall for our area. To make matters worse, the temperatures have dropped and it has been cloudy and humid. 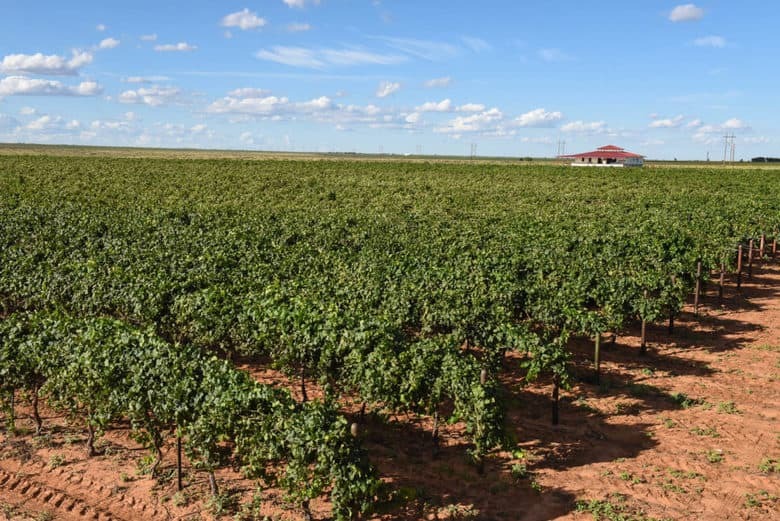 One thing that makes our area ideal for grape growing is the dryness. Moisture and humidity encourage mold and fungus. For the grapes to ripen, we need sunshine and hot temperatures. 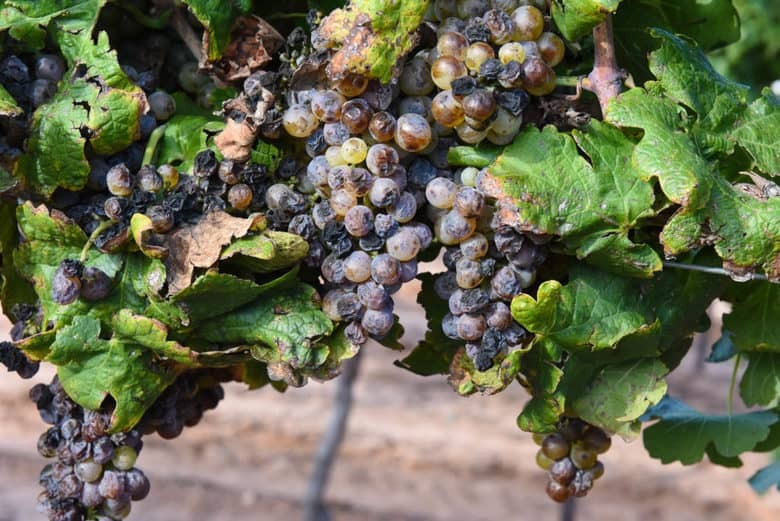 The humidity and coolness have made an excellent breeding ground for a fungus like bunch rot or Botrytis cinerea to grow. Bunch rot can also be found in your garden and in other agriculture and it is known as grey mold. Regardless of the name, the effect is the same – hard to control and potentially devastating. In our case, we have lost the whole Roussanne grape crop for 2016 – about 41 tons worth of grapes. We had been battling the bunch rot for about a week and felt as though we were winning the battle. What a roller coaster! One day we thought the crop was saved, the next day it looked dismal and then it would looked better. We began noticing a hint of bunch rot on Aug. 25 and sprayed the next day. Then, because of the rain, we could not get in the vineyard to spray again. On Friday, Sept 2nd, we pulled a sample to check the Brix (sugar level) and pH of the grapes and they looked good. Yes, you could see where the rot had been but, it appeared that the spray had worked. Saturday, Sept 3rd, we sprayed again using a different fungicide. John and I walked in the vineyard Sunday just to check and felt so much better about the crop. We decided that it was time to get the infected clusters out of the vineyard and would start cutting out the bad fruit the next day. Monday (Sept 5), we went out to the vineyard, armed with clippers and buckets to cut out the bunches of grapes that had rot in them. Oh my goodness! We could not believe what we found. 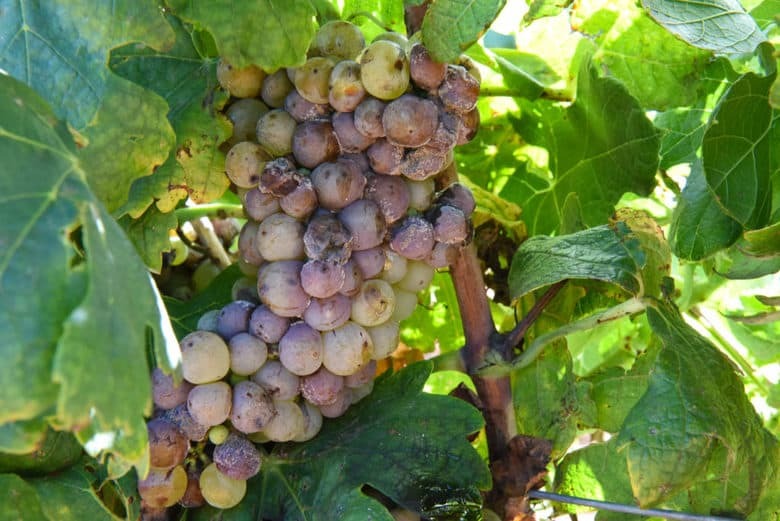 The bunch rot was everywhere in the Roussanne. We finally pulled the plug and phoned the wineries to let them know that the battle between the Roussane grapes and bunch rot was over. Quality wine could not be made from these grapes! Not only did they look gross, wine made from them would have an off taste. It truly was amazing how fast the bunch rot consumed the grapes. One effect bunch rot has on the clusters is to weaken the skins. In the photos above, you can see berries that are a grayish color. These berries have very soft skins that slough when touched. Other berries have the active bunch rot spores growing – you can see the fuzzy white of it on the outside of the grapes. As we walked through, hoping that it was just at one end of the vineyard, it was really disappointing to find a good, healthy looking cluster, only to turn it over and find the fuzzy white rot had infected it. In those cluster, if you pulled them apart, most of the time the center of the cluster was moldy. 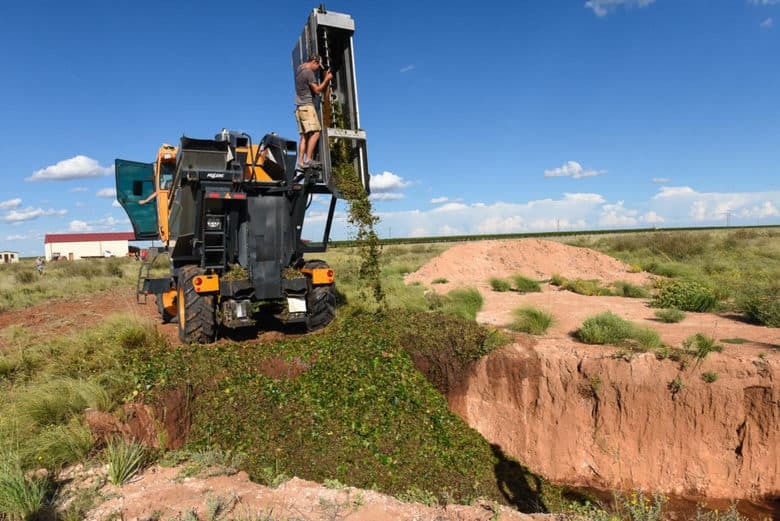 So, what did we do with 41 tons of grapes with bunch rot? Because bunch rot is spread through spores and we typically have a lot of wind which could spread it to our other grapes, we wanted to get them out of the vineyard. Harvesting without the blowers on (they help blow the leaves out and give a cleaner pick), the grapes were dumped. We had a big hole that was dug for another purpose and never used so, now it has 41 tons of grapes and juice in it. On a happy note, the rest of the vineyard is doing well. We walked through each row checking for bunch rot just to make sure. 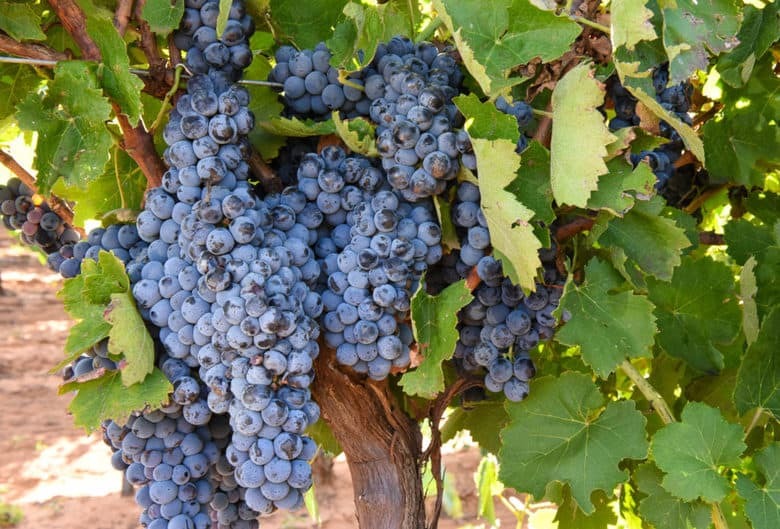 The Aglianico, Montepulciano and Petit Verdot all have tougher skins so they are not as susceptible to bunch rot. Even though there is none visible, we know that the spores are in the vineyard so, we are spraying everything with a fungicide to prevent an outbreak. There is a saying that the most important fertilizer in a vineyard is the owner’s footprints. We know that even though our presence in the vineyard is important, ultimately, it is all in the Lord’s hands. 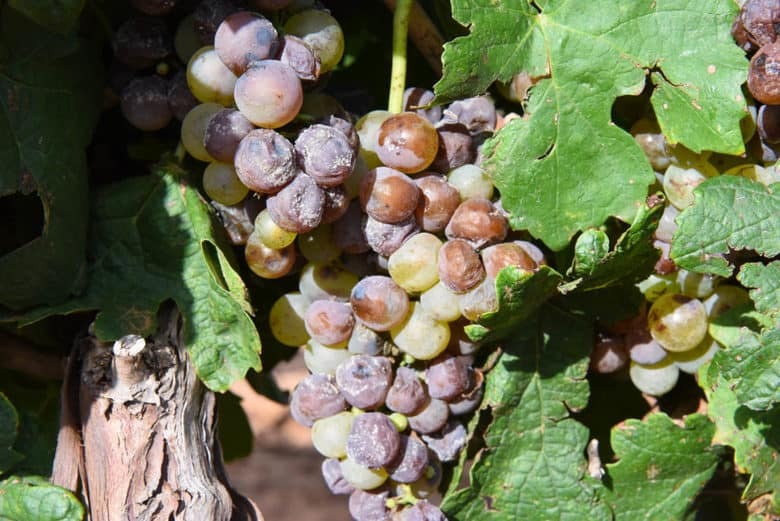 « Veraison and Cluster Counts = Ripening Grapes!